WERE THEY FREE AND FAIR? WHY DIDN’T OPPOSITION DO BETTER? October 18, 1985. Arrive in Dar es Salaam. October 19. Election rally in Kinondoni, Dar es Salaam. Music, warm-up speeches and jokes; boys on stilts help to entertain the moderately-sized crowd. Large numbers of uninterested passes-by showing signs of election-fatigue. Finally, presidential candidate for the ruling Chama cha Mapinduzi (CCM) Party Mr. Benjamin Mkapa arrives standing atop a Landrover and accompanied by a procession of other vehicles. He looks as though he is hating every moment of the slow procession into the centre of the, by now, much larger crowd. His Vice-Presidential running mate Dr. Omar Ali Juma, the Chief Minister of Zanzibar, clearly a more seasoned campaigner, smiles and enjoys himself. But once he gets hold of the microphone Mr. Mkapa looks happier. He speaks clearly and forcibly. He points out that CCM has provided peace and stability since independence and it could be risky to throw it all away. He spends a surprisingly long time talking about foreign policy on which, of course, he is the expert, but it can hardly be a subject of priority for the people of this densely-packed suburb. October 19. Comfortable (US$ 30) hydrofoil journey to Zanzibar. Coloured portraits of Dr. Salmin Amour, the CCM leader, everywhere. A helpful porter at the dockside explains that you can get Dr. Amour’s pictures free but you have to pay for pictures of Mr Seif Shariff Hamad, the Vice-Chairman and Zanzibar leader of the Civic United Front (CUF)! This surprising information turns out later to have some truth in it. We (myself and a journalist from the ‘Economist’) stop on the roadside and attend a small, quiet but highly organised and very good-natured meeting of supporters of the CUF. Lively speeches and great emphasis on the historic nature of the decision voters will be taking in two days time. Arrival at the hotel and the lights go out – but only for one hour under a power-sharing scheme with other parts of the town. By election day however, the nightly power cuts no longer seem to be necessary!. October 20. A day-long briefing for the 130 international observers. They are told that they are there to observe and not to intervene but they should use their common sense when problems come up. They did not then realise how many problems they were going to face. Lots of questions are addressed to the Zanzibar Electoral Commission (whose Chairman and Deputy Chairman are present) about the earlier voter registration process which had been boycotted for a time by the CUF opposition. How many objections had there been? Originally about 1,000 but now only 600 remained. How much did it cost to raise an objection? A deposit of Shs 5,000. Had there been intimidation? Yes, in three cases in Pemba and also in Zanzibar town. The ZEC had sorted them out and sacked one registration clerk. Was it true that 3,000 CUF supporters had been taken off the register and 20,000 had not been allowed to register? No, but the law did specify that to register in Unguja, you had to have been resident for five years and some Pembans therefore did not qualify to vote. The average size of a constituency was 7,019 votes. Voters had to place their ballots in three boxes – for the President, the MP and the Ward Councillor. Next off to the Ministry of Information to collect the rmagicl press card. With this document priority of entry was guaranteed to every rally, every press conference, every event. In the evening, in a huge aircraft hanger-like building, the elders of Zanzibar, women on the left, men on the right, are invited to hear Union presidential candidate Professor Ibrahim Lipumba (CUF) who had been chosen to contest the election at the last minute when the CUF failed to agree with Union opposition leader Augustine Mrema (NCCR-Mageuzi party) on a joint candidature. Lipumba speaks eloquently and repeatedly about honesty and probity and justice in government. “We want leaders” he said “not rulers”. In the evening I meet a pilot and copilot of an 8-seater plane hired apparently by CCM from Kuwait. It is part of what is clearly a no-expenses-spared CCM election campaign. October 21. A carnival atmosphere. I don’t think anything as exciting as this has happened in Zanzibar for some time. Two big final political rallies. In the morning it is the CUF. At all the meetings I later attend the respect and tolerance so typical of Tanzania is there to be seen. What happens is that the opposing party fills a truck with supporters and party banners and drives past the opposition meeting, makes a lot of noise, receives some banter in return and then, after two or three passages, withdraws and politely leaves the other party to continue its meeting in peace. Bright and colourful head scarves of the women sitting on the ground in the middle of this CUF gathering make a beautiful picture on this hot sunny day. It is very much like a prayer meeting – so disciplined and orderly and the rapt attention paid to all that is said. Even the bicycle park is carefully demarcated and supervised. Three white doves, clearly well trained, are released and wheel over the huge assembly to the delight of everyone. And the CUF leader, Seif Shariff Hamad, wearing a light beige safari suit and a distinctive beard both looks and behaves as if he is on an evangelical crusade. He gives a powerful speech in the mellifluous pure tones of Zanzibar Kiswahili. Amongst other things he says “Under the British this island was run efficiently. We aim to do the same”. In the afternoon a much larger gathering. A higher calibre pop band to warm things up is followed, to the great excitement of the crowd, not be doves, but by the release from a low-flying aircraft, of thousands of last-minute leaflets exhortating people to ‘Vote CCM’. Many speeches culminating in an impressive performance by the CCM Zanzibar presidential candidate Dr. Salmin Amour who reiterates the message about peace, progress and stability and how his party rescued Zanzibar from its original oppressors. The presidential candidate then drives away in his luxurious Mercedes saloon followed by a truck load of heavily armed police. Part of the crowd, which had stood back from the meeting and seemed apathetic or tired of listening to speeches, now shows its political allegiance; they warmly and loudly applaud him on his slow passage home. Some tell me that they are “not going to hand the Zanzibar back to the Arabs” – something about which there appears to be widespread fear. The ideological differences between CCM and CUF do not seem to be great although CUF believes that injustice was done in the past to landowners and should be redressed. CUF would be likely to foster closer relations with and more investment from Oman and the Arab world and, although accepting the need for a continuation of the Tanzanian Union (all major parties agree on this) would want more autonomy for Zanzibar than CCM is likely to favour. October 22. Election day. It is reminiscent of the scenes at the South African election last year. But this time it is not the hot sun which causes the suffering. This time it is torrential rain. A moving scene long to be remembered – as the clouds open nobody moves from his/her place in the long lines waiting to vote. In a massive turnout (over 95%) almost everybody is soaked and soaked again as the rain goes on and on. But the voters remain resilient and doggedly determined to vote. Let there be no doubt about the enthusiasm for multiparty elections in Zanzibar. But then things start to go wrong. The educational level of many polling clerks is such that, although they have only 300 names on their voters lists it sometimes takes almost a quarter of an hour for the clerk to find the name of one voter on his or her list. 11 am…..1pm…. 3pm ….. and at many polling stations voting has not yet started. Some people are still trying to vote in the pitch dark at midnight. Tension rises. At one polling station in a large secondary school, although voting is long since over, at 10.30 pm the counting has not yet started because there are no lights. Eventually CUF provides a generator and all the lights come on. But the counting does not start. The CCM representative, who is not joking, says that counting cannot begin under CUF lights! Entreaties to the effect that light is light whoever provides it, are met with a firm no. Eventually at about midnight a collection of official hurricane lamps arrives. But mutual suspicion remains. We are all called in – observers and pressmen alike – to calm the atmosphere but a compromise is worked out under which all the lamps will be placed in one room and each collection of ballot boxes will be counted separately and not simultaneously as originally planned. Hence the beginning of the long delays in publishing results. Counting goes on and on. Polling clerks are assiduous in opening the boxes and showing everyone present how every single vote has been cast. Long arguments about where exactly the tick has been placed on the ballot paper. A lot of people sleep at the polling stations. Observers on duty until the early hours. October 23. Counting of votes continues all day. October 24. The CUF issues a statement saying that the CCM is rigging the elections and lists 14 irregularities. They call for a total recount in the presidential election and the right to inspect closely the electoral register. Outside the CUF headquarters two units of the armed Field Force arrive suddenly and disperse the crowd with some vigour. The few Asian shopkeepers still open, close and bar the doors of their shops inside 15 seconds! We talk to CUF Secretary-General Shabaan Mloo who elaborates on the extent of what he claims to be the rigging. He says that the army and the police had their own polling stations; how could they have voted, as he claimed they had done, 100% for CCM? Later, at one polling station, it takes 45 minutes of argument to decide whether CCM won 44 or 45 votes in a ballot box. The CCM polling supervisor eventually breaks the deadlock by agreeing to accept the figure 44 ‘provisionally’ pending the final tally! From Dar es Salaam the Daily News reports that Professor Lipumba (CUF Union presidential candidate), who had been expected to mobilise a substantial Muslim vote in the mainland elections, is facing a civil suit in the High Court filed by a resident who claims that the Professor has committed adultery with his wife. Here in Zanzibar, to considerable surprise, if not disbelief as so few results have been issued, it is reported that there has been an announcement stating that Dr. Salmin Amour will be sworn in as President in two days time! I had planned to return to the mainland today assuming that the Zanzibar election would be over but decide to stay on. Most of the rest of the media do likewise foreseeing further drama. October 25. A clearly agitated CCM issues a statement saying that the elections have not been free and fair and that fresh elections should be held in six months time. Many people had not voted; there had been harassment and intimidation by CUF supporters; there were differences between the election results declared at polling stations and those being issued by the ZEC. The Finnish UN diplomat Kari Karanko and his few remaining observers looking harassed as they also find serious discrepancies at two closely fought polling stations. We go and talk to CCM Deputy Secretary-General Ali Ameir Mohamed who explains that it was not an easy decision to reject the election results but there had been so many discrepancies. The Electoral Commission had clearly been incapable. The observers had exceeded their mandate and had to be very careful when working in a third world environment as they could trigger the sentiments of the people. Asked whether, as it seems that the election is going to be almost a dead heat, it would not be wise to set up a government of national unity as proposed by CUF, The Deputy Secretary General tells us that this is not South Africa – where the arrangement is only transitional after all – there are all kinds of historical, ideological and political reasons why it would not be feasible in Zanzibar. Most of the CUF leaders were in earlier Union and Zanzibar governments. We should read the party manifestos and see how much they differed. CUF had been promising heaven. Still no official declaration of results. I go to the ticket office to postpone my departure yet again. In the absence of truth, rumours flourish. One rumour says that Dr. Amour has been to see President Mwinyi and told him that CCM is in danger of losing the election. President Mwinyi is said to have replied that this is democracy and the result must be accepted. Dr. Amour is then said to have stated that he is not prepared to do this and will deal with the matter in his own way. But it is only a rumour! In the evening, Dar es Salaam TV announces that CUF has won. People are not sure whether to believe it or not. Julius Nyerere, speaking at a rally in Support of Benjamin Mkapa in Morogoro, is reported on the radio to have appealed to the two leading parties to accept the result whatever it is. Later, when he hears the result, he suggests that, in view of the closeness of the result a government of national unity would be the best solution. October 26. 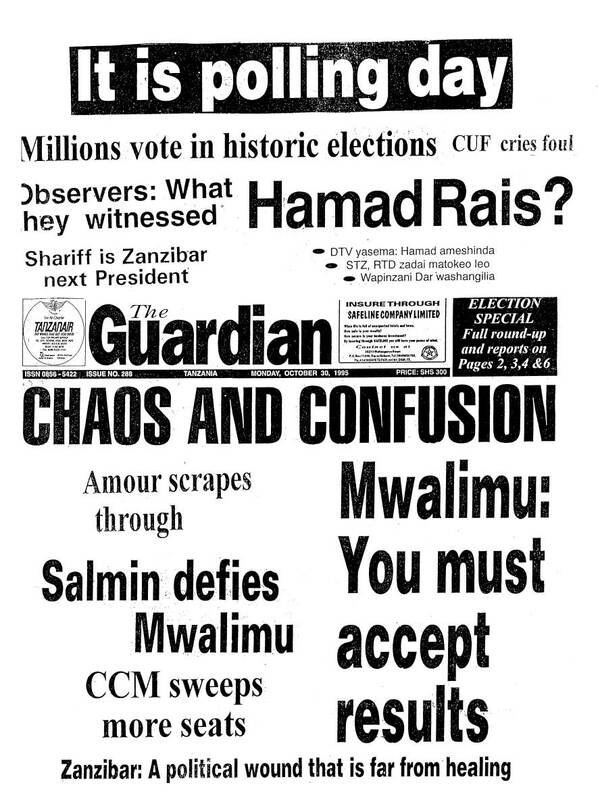 The English language newspaper ‘The Express’ and the Swahili newspaper ‘Majira’ announce prominently on their front pages that Seif Shariff Hamad has been elected as President of Zanzibar by 164,548 votes to 155,787 for CCM. Other papers print the same news with a question mark. Augustine Mrema congratulates Hamad on his victory. In Zanzibar tension rises as everyone waits for the Zanzibar Electoral Commission to finally issue the official results. People standing around radios all over the town. Most shops firmly closed. A long private meeting of the leadership of the ZEC. A twice postponed press conference finally starts in a very small, stiflingly hot room at the ZEC at 2.30pm. If a pin were to drop you would hear it. The result is announced. CCM has won by a majority of 0.4% No questions allowed. There is no appeal against the decision. The ZEC Chairman disappears rapidly. One observer is overheard to say that this is a disaster. The media pack besiege the CCM’s Ameir Mohamed. Does he still feel that the elections were not free and fair? With face beaming he replies that he is very happy with the results and on the other point he will have to speak to his colleagues. He fights his way to his car. Within minutes jubilant CCM supporters are out on the streets noisily celebrating. Cars with horns blowing; CCM flags everywhere. CUF supporters not easy to find and very subdued. The entire media pack jumps into anything with four wheels and sets off at high speed for what turns out to be a very modest single story house in Mtoni – the home of Seif Shariff Hamad in the outer suburbs. He is expecting us. He brings chairs into the garden and in a cool and relaxed tone states that he finds the results totally unacceptable. It is simple, he says, more people have voted than there are on the electoral register. His party will not work with what he describes as ‘this illegal government’ in any way and will boycott the Union elections on Sunday. This latter decision is subsequently overruled by the CUF Executive Committee. Asked what will happen next he says that CUF members are well disciplined and there will be no violence. The new president will be very oppressive. Hamad will continue to inform international public opinion about what has happened. While he is speaking, a Landrover full of armed police arrives, Have they come to arrest him? No, they say. They are here to give him extra security. He tells them that he doesn’t need it. They look rather uncomfortable midst so many foreign TV cameramen and stay outside, beyond the gate. The remaining observers continue checking and rechecking results. It seems that they are in a dilemma. Some observers want to publish their figures. Others fear that it might cause disturbances. The observers appeal to all parties to keep the peace. President Mwinyi is reported on the radio to have sent his congratulations to President Amour on his victory and to Mr Hamad for participating and for the results he has achieved. I postpone my departure for the mainland yet again but am becoming worried that I may miss what is, after all, the main event on the mainland. CCM celebrations continue. October 27. Nineteen hours after the declaration of the results Dr. Salmin Amour is sworn in at a colourful and well organised ceremony midst thousands of excited CCM supporters at the Amaan National Stadium. A 21-gun salute. Western diplomats conspicuous by their absence but the locally resident consuls of India, Mozambique, China and Oman can be seen in the grandstand as can the Kenya High Commissioner. I catch the hydrofoil to Dar es Salaam in the afternoon. Arrive in time to attend the penultimate rally of down-to-earth Union presidential candidate John Cheyo (UDP). His final rally next day is to be on his home ground in Shinyanga. It is a very small gathering lost in the vast open spaces of Jangwani. He is much the most entertaining of the presidential candidates – some very good jokes, clear enunciation and pronounced Thatcherite views. He wants to clear away restrictions on land ownership, actively encourage investment, close down cooperative unions. Tanzanians must be allowed to make money he says. But few seem to take him seriously. October 28. NCCR-Mageuzi supporters with flags on every street corner in Dar es Salaam. A festive air. Can NCCR presidential candidate Augustine Mrema surprise everyone by beating the powerful CCM? To the ordinary visitor it seems obvious that he will. Young and excited NCCR supporters are everywhere. In the afternoon a massive and well organised NCCR rally with fiery speeches from several speakers – a particularly fiery one from the lawyer Dr. Mazumbuko Lamwai. 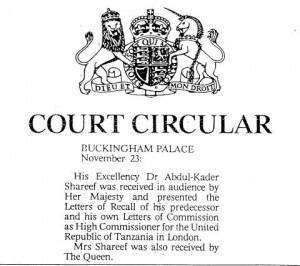 “Seif Shariff is the true president of Zanzibar” he shouts. Loud applause. Perhaps the loudest applause of the whole afternoon. Nine prisoners, pardoned on October 20 by President Mwinyi, after having been given life sentences in December 1985 for plotting to overthrow the government and having completed 13 years in jail, are paraded before the crowd. The speeches culminate in a bitter attack by Mrema on Julius Nyerere which is received less enthusiastically. “He says that we are vagabonds, that we are inexperienced … but I’ve been a Minister for four years!” Mrema says. At Jangwani at the same time the CCM fills the vast space with what must be the biggest rally of the whole campaign. Benjamin Mkapa speaks yet again about peace and stability and continuity and says that CCM alone has the experienced and capable people to lead the nation. And at the same time Professor Lipumba closes his campaign with a small rally at Mnazi Moja. October 29. Mainland election day. In the centre of the city Asian CCM supporters calmly queue and vote without difficulty. But we then tour Ukonga and are besieged at almost every stop by angry people. These are not passive Zanzibaris. And again they assume that we are observers. They expect us to do something. One angry roadside hotelier protests that his premises have been taken over as a polling station by the Police without consultation even though he has already cooked the chicken and rice for his customers! Who is going to compensate him for his loss of business. Eventually he cools down and begins to see the funny side of it. It is mid-day and voting has hardly started at many polling stations. One cannot but admire the ingenuity of the election staff in converting the most unpromising of premises into functioning polling stations even though often of extreme simplicity. Secrecy is often ensured by a single piece of gunny bag suspended over a small table. An angry lady complains that she left her breast-feeding baby at home when she came to vote at 6am and still voting hasn’t started. By the end of the day thousands had found it impossible to vote as their polling stations never opened. Widespread shortages of ballot papers, special ink, rubber stamps. There are accusations that the worst affected constituencies are those in which the opposition has the best chance of winning. A four-hour extension of voting time is announced in the afternoon by the National Electoral Commission (NEC) but even this doesn’t solve the problem for many voters who have given up hope of taking part in the election. Many polling stations still do not open. At Kawe angry people attack a car containing Shs 2.7 million in cash and ballot papers when they find posters supporting CCM in the car. October 30. After headlines in the morning press like ‘CHAOS AND CONFUSION’, National Electoral Commission Chairman Judge Lewis Makame announces, in a surprisingly nonchalant way, at a much delayed and packed press conference, that the Dar es Salaam election will have to be held again later. Some upcountry polling stations will also remain open tomorrow. October 31 First results indicate a clear win for the CCM. No celebrations because the results are few and far between. Confident CCM Campaign Director Col Abdulrahman Kinana tells me that there is a widespread but faulty assumption that, when you introduce multi-party elections, the ruling party has to lose. He sees no reason for the Dar elections to be held again. Polling could continue for a day or two longer, he says. He is very critical of the Electoral Commission. November 1. A few more results confirm CCM’s big victory. Ten opposition parties file a petition with the High Court to nullify the elections. November 2. Powerful oratory at a loud protest meeting at the Starlight Hotel Hall of all the opposition party leaders – finally together in defeat – to demand new elections and an interim government under the Chief Justice. November 3. A densely packed gathering at the High Court to hear the result of the appeal of the opposition parties. Justices Luhekelo Kyando, Josephat Mackanja and William Maina reject an opposition request to bar further issuing of election results. A few over-exuberant opposition supporters create a disturbance outside and are taken away by the Police. One of them tells me later that he paid the police Shs 2,000 and they let him go. The others paid what they could afford! November 13. The High Court dismisses with costs the opposition’s application in a 19-page ruling. November 16. The leaders of most of the opposition parties declare that they will boycott the Dar es Salaam elections. November 19. 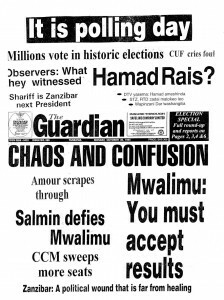 Second election in Dar es Salaam. Half of the registered electors turn up to vote; no problems at polling stations. November 20-23. Final election results announced exactly one month after the elections began. CCM takes six seats and NCCR one in Dar es Salaam and Benjamin Mkapa has won a great victory for CCM. Although Tanzania’s long-time ruling party the Chama cha Mapinduzi (CCM) won the Presidency and the elections for the Union Parliament in Tanzania convincingly, for the first time in the history of the country, a powerful block of 50 opposition MP’s now sit in Parliament to keep cabinet ministers on their toes. 1f it had not been for the doubts surrounding the conduct and result of the elections in Zanzibar and for the chaos and confusion which occurred there and in Dar es Salaam requiring the latter elections to be cancelled and then held again, this would have been described as another impressive success story on the road to democracy in Africa following the successful elections in South Africa, Namibia, Malawi, Zambia and elsewhere. As the ‘Business Times’ put it, ‘Tanzanians showed exceptional political maturity even under the very trying circumstances many of them faced. Even the voters who were most frustrated in their desire to vote or most dissatisfied with the result made only a few derogatory remarks and eventually returned to their homes peacefully – a good sign of political tolerance. People did not overreact and kept their cool’. 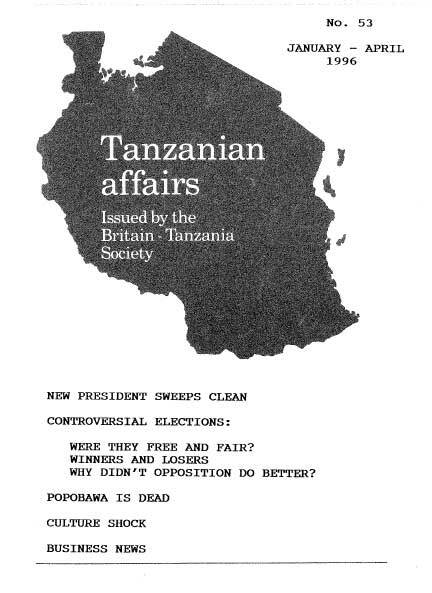 (I am grateful to many people in Tanzania and in Britain for help in obtaining information on which parts of this diary and the following election articles are based. Particular thanks are due to Joseph Masanilo, Cuthbert Kimambo and Jwani Mwaikusa – David Brewin). ZANZIBAR. Most responsible opinion recognises that the actual process on election day was free and fair. But something happened in the counting, either at the polling stations or at the Electoral Commission or both to cause most independent witnesses to have serious doubts as to whether the election results did reflect the true wishes of the people. The registration process had also been beset with problems and the rule under which only residents of five years standing could register was a disadvantage for CUF. During the long-drawn out counting process, part of which was carried out in the dark, both parties declared in writing that the elections had not been free and fair. On November 21 ten of the 17 main donors issued a statement which said that ‘The figures announced by the Zanzibar Electoral Commission (ZEC) do not always correspond with the figures recorded at the polling stations. …. A reconciliation could alter the outcome of the presidential election-…the ZEC was notified of the discrepancies prior to its final announcement of the results but went ahead with the announcements without rectification. Given the narrow margin between the presidential candidates the results of the presidential election declared by the ZEC may be inaccurate. … Representatives of the donors made their concern known to the President of the Union on October 27- They suggested that corrective measures should be made to the figures when they called on him on October 29 but nothing was done. The International Observer Team attempted to reconcile the discrepancies and confirmed their existence in the final compilation of the figures. In other cases …… observers were denied access to the data by ZEC and other officials and they found the ballot boxes and records compromising’. On November 23 Zanzibar Electoral Commission Director Aboud Talib Aboud said that the results were valid. “The ambassadors in their statement have an intention to cause controversy over the validity of the president …. Some Western countries had decided on their own president even before the elections had been held ………. observers had been given the information they needed but some tried to direct election officials what to do” he said. The CUF refuses to recognise the new government and is boycotting the Zanzibar House of Representatives although its MP’s agreed to be sworn in. What is clear is that Zanzibar is divided almost exactly in half in its political allegiance. And Pemba does not wish to be ruled by the CCM as it failed to elect even a single ward councillor in the elections. But as the tough re-elected President Amour correctly pointed out, in democracy, even if you win by one vote, you win. THE MAINLAND. Most people believe that the results did broadly reflect the wishes of the people although the Commonwealth observer group spoke of ‘unique irregularities and discrepancies’ that had never been observed in Commonwealth countries before. The ten OAU Observers praised the tremendous patience, maturity and tolerance of the people but said that the actual conduct of the elections failed to live up to expectations. However, there was a consistent voting pattern. The main NCCR opposition was very strong in Moshi, from where its leader comes, and also showed strength in some urban areas with large numbers of young voters who tended to support the opposition. In rural areas by contrast, the CCM usually achieved big majorities which reflect the party’s long established grass roots organisation. It is perhaps significant that, at the end of the voter registration period earlier, only 25% of voters had registered. After an extension of two weeks the percentage went up to about 75%. Presumably it was the efficient CCM machine which ensured this. The ethnic support for John Cheyo (UDP) in the Shinyanga region and the success of three strong CHADEMA candidates in different parts of the country lend credibility to the exercise. Furthermore, the main opposition parties have accepted the presidential result even though well over a hundred losers in parliamentary elections are appealing to the High Court with long lists of alleged irregularities. In Dar es Salaam there must be suspicion that middle level CCM cadres fighting very close constituency elections may have tried to do some rigging. The Electoral Commission said that the problem in Dar es Salaam had been that because of its proximity to the government stores, which held the ballot materials, Dar es Salaam was the last part of the country to receive its supplies – hence the delay in opening polling stations. It is unlikely that results from the second vote in Dar es Salaam fully reflected the wishes of the people there because the opposition had declared a protest boycott. Arusha 60%, Kilimanjaro 20% (NCCR got 78%), Tanga 75%, Singida (75%), Iringa (67%), Rukwa 62%, Kagera 56%, Shinyanga 52%, Moroqoro 64%, Mbeya 57%, Ruvuma 78%, Mara 56%, Mtwara 89%, Mwanza 58%, Tabora 58%, Unguja North 75%, Unguja South 82%, Unguja Urban 64%, Pemba North 12%, Pemba South 23%. Nominated women candidates: CCM 5; CUF 4. Nominated by President: 10; Regional Commissioners: 5. Over 40 former CCM MP’s including Education Minister Dr. Philemon Sarungi and Minister of State in the Prime Minister’s Office and five Regional Commissioners failed at the first hurdle and were not selected as candidates for the election. Most former cabinet ministers and CCM leaders won their seats easily. Former Prime Ministers John Malecela and Cleopa Msuya had no difficulty in winning their seats – Malecela at Mtera by 27,368 against CUF’s 1,052 and Msuya at Mwanga, Kilimanjaro by 23,134 against NCCR’s 3,352. Mr George Kahama head of the Investment Promotion Centre had no difficulty in winning in Karaqwe, Bukoba by 24,290 to NCCR’s 15,591 and UDP’s 5,433 votes. NCCR did very well in Moshi region and comfortably won seats in Moshi Urban and Rural, Vunjo, Hai and Siha; it also won in Iringa Urban, Arusha Urban, Rorya, Mbeya Urban, Muleba North, Urambo East, Musoma Rural and Bunda. Deputy Attorney General (26,813) and a disappointing 9,085 for the respected one-time Finance Minister and CHADEMA leader Edwin Mtei. Makongoro’s father, Mwalimu Nyerere had earlier joked “My household is really in the forefront of reform. I have CCM, CUF and NCCR followers”. Daughter-in-law Leticia Nyerere is the daughter of CUF Chairman Musebi Mageni. The lawyer Dr Masumbuko Lamwai who took the opposition case to annul the elections to the High Court three times without success and was reprimanded by the judges in the case for ‘turning the court into a political circus,’ won Ubungo in Dar es Salaam, after insisting on standing in spite of his party’s boycott of the second Dar es Salaam election. Former Justice and Consitutional Affairs Minister Samuel Sitta, who has been MP for the area for 20 years was narrowly beaten (10,788 to 9,497) in Urambo East by NCCR’s Msina Jacob Abraham . Mr Stephen Wassira, a former Deputy Minister of Agriculture defected to the NCCR after complaining that money changed hands during the CCM candidate selection process at Bunda (Mara). He then won the seat for NCCR with 18,815 votes against former Prime Minister Joseph Warioba’s 17,527. Warioba has appealed to the High Court against the result. Ndimara Tegamwage, Chairman of the 12-nation Media Institute of Southern Africa (MISA) won for NCCR in Muleba North. One of the youngest MP’s, if not the youngest, is Mr James Mbatia, the NCCR party’s election director who swept in with a massive 54,724 votes against CCM’s 6,468 at Vunjo, Moshi. CHADEMA’s P S Willbroad got 20,015 votes defeating the veteran politician P S Qorro CCM (16,781) in Karatu, Arusha. Dr. A W Kabourou, who appealed against his defeat in the Kigoma Town seat by-election last year and won his appeal, beat narrowly (15,478 to 15,205) the same opponent, CCM businessman A S Premji who is appealing against the new result. And former Minster Basil Mramba lost in Rombo, Moshi to CHADEMA’s J A Salakana by 35,132 (CHADEMA), 23,610 (NCCR) and 11,388 (CCM). UDP won Bariadi West, Bariadi East and Kisesa all in Shinyanga region. There were 13 parties in the election but the eight smaller parties did badly. What the opposition parties did do was to wreck the chances of NCCR-Mageuzi gaining a number of seats where the combined opposition vote was greater than that of CCM. Examples of this were Morogoro Town, Buyungu, Bukoba town, Kigoma South, Kigoma North, Ukerewe (where speaker of the House Pius Msekwa stood) and Nzega; in Tabora South TADEA’s C Tumbo would have won if the other opposition candidates had made way for him. Tanzania’s continuing racial tolerance was illustrated by the success of a number of Asian CCM candidates: businessman Abbas Gulamali Mohamedali won in Kilombero; M M Mudhikur in Mchinga, Lindi, R Aziz in Igunga, Tabora and Bohoran leader, Adamjee Zainuddin Tayabali at Kawe in Dar es Salaam. WHY DIDN'T THE OPPOSITION DO BETTER? Firstly, there was a return of some ethnic feeling as the NCCR came to be regarded more and more as a Chagga party. Secondly, there were fears – many will consider them irrational – about how far the unpredictable populist Augustine Mrema might go if he became president. Could he become another Idi Amin? Would Tanzania become another Rwanda? Was he prepared to accept advice or would he rule alone? Thirdly (Mr. Mrema considered this to be the main cause of his defeat) there was the powerful intervention of Mwalimu Nyerere who was indefatigable in making his point (which was broadcast on national radio) that Mkapa was the only person fit to be president and Mrema was particularly unfit. Fourthly, the opposition was fragmented. The NCCR-Mageuzi insisted on putting up candidates in every seat and Mrema’s failure to establish an alliance with CUF, as a result of his abortive attempt to appoint veteran politician A M Babu a his Vicepresidential running mate, damaged his chances further. Fifthly, the CCM gained a substantial advantage from the decision to pay subsidies to all candidates standing in the election thus encouraging small parties to stay in the race even where they had no hope of winning. Sixthly, the opposition failed to concentrate on registering its Supporters at the crucial time. Many of those in the vast throngs who attended Mrema rallies around the country could not vote for him when the time came. Finally, Mrema’s performance in the TV and Radio debate compared poorly with that of other presidential candidates. The new president’s first action on taking up office was to declare his assets. He owns two houses – one in Dar es Salaam and one in his home town Masasi – an undeveloped farm, and four cars. As he entered the new National Assembly for its first meeting, opposition MP’s joined in the applause. In his first message to parliament he warned that stern measures were in the offing for tax defaulters and irresponsible tax collectors. He was willing to enlist the support of the opposition in supervision of his government to ensure that it stuck to the CCM manifesto on which its election campaign had been based. On tax evasion he said that anybody in arrears should pay immediately and action would be taken against those who did not. The government would also not entertain irresponsibility amongst tax collectors. With immediate effect all ministries and departments would have to spend only within their allocations. undisciplined government accounting officers would be fired. The name of anyone taking a bribe would be made public and such persons would be fired. Properties of persons proved to have taken bribes would be confiscated. President Mkapa said that the privatisation programme started by the Mwinyi administration would be continued. Small time miners, farmers, fishermen and herdsmen would be assisted through the provision of modern equipment. The President has also made it known that he does not wish to be addressed as ‘Mtukufu’ which could be taken as implying that he was divine. He said he would rather be called ‘Ndugu’ (Brother) or ‘Mheshimiwa’ (Honourable) as these were the titles he was qualified for. Coinciding with the President’s words two bribery cases were concluded. Police Officer Juma Nassoro was Sentenced to ten years in jail after having solicited Shs 5,000 in exchange for not taking a man to court for an alleged crime. A Customs Officer was found guilty of soliciting a shs 50,000 bribe as a pre-condition for reducing tax of shs 140,000 on imported video equipment. Both reeived ten year jail sentences at a court in Mtwara. His Excellency Mr Abdul-Kader Shareef was received in audience by Her Majesty and presented the Letters of Recall of his predecessor and his own Letters of Commission as High Commissioner for the United Republic of Tanzania in London. Mrs Shareef was also received by The Queen. New Prime Minister Frederick Sumaye was chosen by president Mkapa but then had to obtain the approval of Parliament. He did so by 232 votes to 34. The opposition first had to qualify for official status as an opposition by having at least 30 members. This was rapidly achieved when the four UDP members united with the 28 CUF MP’s (the parties share an ideology which could be described as to the right of the other parties) to form the official opposition. They elected Mrs Fatima Magimbi, a self-made woman from Zanzibar, who rose from Secretary at the University of Dar es Salaam to full lecturer status through diligent part time study, as leader. She lost no time in telling the prime Minister that his first priority Was to Correct the ‘irregularities’ in Zanzibar and ensure that Mr Seif Shariff Hamad could take up ‘his rightful place as president’. Mr Mabere Marando MP whose self-sacrifice in giving up his position as leader of the NCCR-Mageuzi party early this year to Augustine Mrema, which enabled the latter to invigorate the opposition and give the CCM a real challenge, also lost no time in making his presence felt in parliament. He challenged the Attorney General on the issue of the form of the oath of allegiance of MP’s and, not only won his case, but also caused three MP’s to go through the process of swearing in a second time in order to regularise the situation. The ‘Business Times’ has described the profile of Tanzania’s new government. It has 23 new faces and comprises 23 Ministers and 10 Deputy Ministers. Twenty-eight have university degrees including two Professors, six with Ph~ls, seven Masters degrees and 14 have first degrees. There are six agriculturalists (including the Prime Minister) and eight economists. There are 13 Muslims and 20 Christians who have been drawn from a total of 18 regions. Thirty were elected and three were nominated.